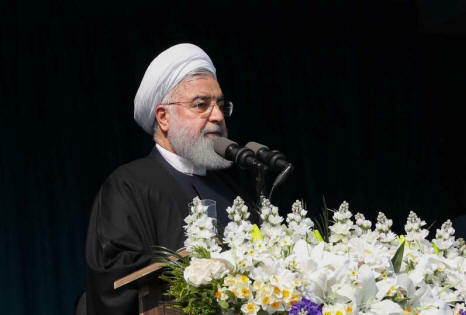 Iranian President Hassan Rouhani on Saturday called for "decisive" action by Pakistan against a militant group behind a deadly suicide attack in a border area, and said inaction by Islamabad could jeopardize relations between the neighbors. Iran's state news agency IRNA said Rouhani's remarks came in a telephone conversation with Pakistani Prime Minister Imran Khan, who said he would soon have "good news" for Iran, according to the agency. A suicide bomber killed 27 members of Iran's elite Revolutionary Guards in mid-February in a southeastern region where security forces are facing a rise in attacks by militants from the country's Sunni Muslim minority. The Sunni group Jaish al Adl (Army of Justice), which says it seeks greater rights and better living conditions for the ethnic minority Baluchis, claimed responsibility for the attack. "We are awaiting your decisive operations against these terrorists," IRNA quoted Rouhani as telling Khan. "We should not allow decades of friendship and fraternity between the two countries to be affected by the actions of small terrorist groups, the source of whose financing and arms is known to both of us," Rouhani said. Iran has blamed its regional rival Saudi Arabia and arch-enemies Israel and the United States for the attack and other cross-border raids, an accusation rejected by the countries. "It is in Pakistan's own interest not to allow our territory to be used by terrorist groups, and the Pakistani army is prepared to confront the terrorists more decisively with the information provided by Iran," IRNA quoted Khan as saying. Khan said Pakistani forces had come close to the terrorists' hideout and there would soon be "good news" for Iran, IRNA reported. To read more content, subscribe to The Friday Times Weekly. A unique way to get your favourite books delivered at your door step! Pay by easy load. Lahore High Court orders judicial inquiry into Sahiwal incident. Pakistan allows hunting of a rare wildlife species..